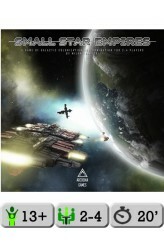 Small Star Empires is a quick area control game for 2-4 players. In this game, players colonize the galaxy using their ships, which they move on a modular board containing hexagonal spaces (systems). The modular board is made up of seven different double-sided sector tiles, which allows for a different map and different experience each time you play the game. During a turn, a player must move one of their ships on the board. They can move the ship only in a straight line, as far away as they want, but they cannot go over systems controlled by other players. After moving the ship, the player has to choose whether to place a colony or a trade station in that system. Both of these mark control over the system until the end of the game, but the trade station gives the player bonus ..